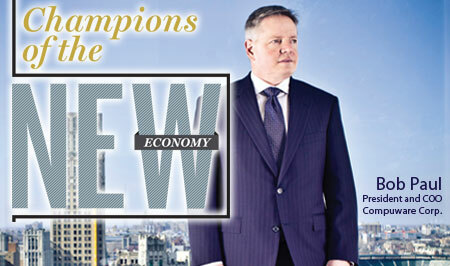 With change an ever-present byproduct of technological advances, we present the Champions of the New Economy. The program was created by Junior Achievement of Southeastern Michigan, which operates the Quicken Loans J.A. 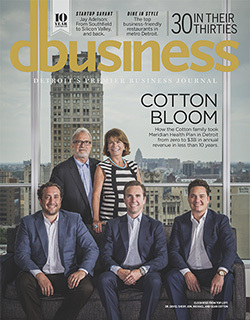 Finance Park in downtown Detroit, and is presented in partnership with DBusiness magazine and News/Talk 760 WJR. On the following pages, we detail the economic journey of five hard-charging executives who have steered their respective companies through incredible change. Why he is a Champion of the New Economy: Tim Bryan is racing at breakneck speed. With hospitals and medical centers requiring added technology to improve patient wellness, prevent diseases, and boost efficiency, Bryan, chairman and CEO of GalaxE.Solutions in downtown Detroit, is moving rapidly to meet the demand for health care IT services — mandated, in part, by the Patient Protection and Affordable Care Act (Obamacare). Q: Since opening an office in Detroit last spring, you’ve hired more than 100 people and you have 200 openings. How do you manage hiring? A: We’ve got a full-time recruiting effort. We’re also beginning to talk to local colleges to create a curriculum to support what we’re doing. We can either bring in recent graduates or people who have been retrained. We’re doing an awful lot of interviewing. We’ve interviewed and hired some really excellent people. We’re very happy with the response. An entity that is ramping up quickly likes to see a great supply of potential workers, and we’ve been fortunate to be on the right end of a great hiring push. Q: Demand for your services is a good thing, but how have you been able to keep pace? A: We are in a leadership position in terms of companies that are outsourcing their work to Detroit. One of the things we’ve done is locate a facility here. We’ve begun hiring a significant number of individuals who will help us build and integrate these systems so health care companies can boost their outcomes, increase their efficiency, and improve their [patient] care. We found a great location downtown next to two other IT-related companies — Quicken Loans and Compuware. We’re starting to see a technology hub come together. And now we’re drawing individuals who are looking to enhance their careers, and who are going to consider downtown Detroit as part of their career search. Downtown has all the elements of what they’re looking for — proximity to entertainment, sports, casinos, cool bars, great restaurants, and high-quality apartments and condominiums. And it’s all in easy walking distance of great offices. You’re really starting to see the diversification of the employment field. Q: Why did you locate in Detroit, as opposed to operating in a low-cost country like India? A: A couple of factors. The cost of doing business here in Detroit is very reasonable. When you compare it to offshore destinations, Detroit is starting to come close on labor costs. Because we’re in the U.S., paying in U.S. dollars, the native language is English, we’re in the Eastern Time Zone, and it’s an hour flight to New York — the so-called soft costs are very attractive. Detroit is very competitive with a number of offshore locations because of those differences. Now, don’t get me wrong; we’ve been successful with offshoring work, but Detroit is a new offering. [In addition,] the region has a highly educated work force with significant technical ability, and the city is committed to improving the area. Q: What’s the reception been? Have you met your neighbors — Dan Gilbert, chairman of Quicken Loans, and Peter Karmanos, chairman and CEO of Compuware? A: Yes, and Dan and Pete have been extremely supportive. They share the vision for Campus Martius being a tech hub. They recognize we’re the first outside entity to locate a data center here — that’s a major statement to the rest of the country, and the rest of the world. They love Detroit and are native sons. My business is in New Jersey, and I came here as a business opportunity. I’ve since fallen in love with the city. The Fox Theatre is one of the finest theaters I’ve seen. Comerica Park is excellent. The Detroit Athletic Club is incredible, and I have become a member. The people are incredibly supportive and welcoming. People who live and work here are upset with what has happened [to the city], but they’re working hard to turn things around. Q: What do you think Detroit could do to improve its image? A: The irony is, I don’t think the rest of the country realized how bad things had gotten. It’s hard for people outside Michigan to envision how hard-hit this city has been. But they probably don’t appreciate the upside potential, either. It’s very important for the city and state to get the word out that Detroit is open for business, like Mayor Dave Bing says. It’s time to put people and resources back to work, and we should share that message with the rest of the world. 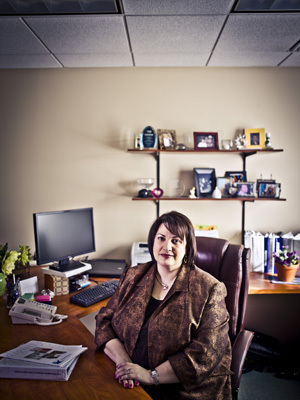 Why she is a Champion of the New Economy: When Gloria Danna Brooks took over as president and CEO of Arbor Hospice Inc. in early 2007, she faced an operating deficit of $2 million and a looming net income loss of more than $750,000. Since then, she’s turned the company around by cutting costs, retraining staff, and selling off a line of business — all while enhancing patient care. Q: What was job one when you became president and CEO? A: Right away, I did an analysis of all of our lines of business to see what was and wasn’t working. We had to stay focused on our core mission while figuring out how to streamline our back-end operations. We had a separate line of business for skilled home care, and at the time we were seeing 200 hospice patients and 20 skilled-care patients — which wasn’t the most efficient way to operate. We sold off the skilled home care business. We also took a look at our operations as it related to staffing needs, and developed a better way to balance our staff without impacting any critical resources. We had a reduction of 16 employees in 2008 and 2009. We also took a good, hard look at technology gains. The company had purchased an electronic medical records system, but the system hadn’t been implemented fully. It took almost two years to get it up and running, but it’s made us much more efficient. In addition, we have 220 employees now serving 235 patients a day, where before we had 200 employees serving 220 patients. We haven’t added any managers; [we’ve added] critical-care employees. Q: How did you account for national Medicare reductions in 2008? A: The [cuts] continue to be rolled out. It really has been a challenge for all hospice providers. Reimbursements are being reduced but what we have to provide, in terms of meeting new regulations, is being increased. If a patient stays beyond six months, he or she needs to be recertified so that reimbursements will continue. We’ve added two nurses to keep up with that volume. Also, the overall Medicare margins will change from 2 percent in 2008 to a negative 14 percent by 2019, so we’re working on accounting for that while implementing additional quality and medical recording systems. Q: How did you keep the financial challenges in 2007 and 2008 from impacting quality of care? A: With all the changes we were making, we never cut clinical services. We actually added more things. We invested in laptops for our clinicians, so they can enter and review data at bedside. It’s much more efficient, and it allows our staff to spend more time with patients instead of heading back to their workplace to enter the data. That’s a change in business that everyone benefits from. Q: Looking back, is there anything you would have done differently to speed up the turnaround? A: If you ask my staff, we went too fast. This kind of major change is difficult. If we didn’t change, we weren’t going to be around for the long term. Our staff now comes up to me and says, ‘I see why you did the things you did.’ One of the things we undertook early on was to make sure management was visible and interacting with our staff. We now do e-mail updates, we have an e-newsletter, and we really stepped up our communication. We are very transparent. It took my staff a long time to understand what was happening, but once we showed them the financials, it helped everyone see that we needed to change. From a mission standpoint, if we can’t take care of patients, we’ve really failed. I can’t stress it enough — and sometimes you have to say it more than once — but you have to build close relationships with your staff, and keep them in the loop as much as possible. It goes a long way toward building a stronger organization. We also did a lot of work to fix our workplace culture. Q: What mechanisms have you put in place to better forecast potential revenue losses? A: When I came into the organization, we didn’t have a budget forecast in place. There was no dashboard. So we’ve really improved our financial outlook. We have key indicators now that the board and all of management look at. It’s a balanced dashboard. We really get management more involved in the budget process, and we explain it to our staff. Why he is a Champion of the New Economy: Taking advantage of the global economic recession in the fall of 2008, Bob Paul, president and COO of Compuware Corp. in Detroit, overhauled the company’s management team and re-engineered key operations to take advantage of growth markets in mobile devices, cloud-computing, and certain IT sectors. Paul also has helped deliver consistent earnings. Q: Health care IT has been a growth market for Compuware. How much of the demand has been created by a real need for efficiency as opposed to meeting new regulations in the Patient Protection and Affordable Health Care Act (Obamacare)? A: One drives the other. Compliance issues drove the initial impetus of health care IT, but the rollout awakened many people to the power of technology as it related to improving quality of care, boosting efficiency, and lowering costs. Large health care organizations, governments, and medical centers are all embracing health care IT. That’s been a boon to two areas of our operations — business core performance management and Covisint [our supplier network]. The activity has really picked up over the last six months because of the federal compliance and the funding that goes with it. The backing will continue for the next two to three years. Q: As the mainframe market continues to mature, how do you balance the company’s resources with meeting rising demand for mobile device applications and services? A: The mainframe market is very mature, and most of the growth is based on increased capacity. There aren’t a lot of new strategic initiatives there. Our job is to make sure our products are running as efficiently as possible, that our existing products and services are current, and that we’re investing in new markets and growth markets. It’s a balancing act, but you can’t afford to stand still. Q: How do you meet the challenge of achieving greater productivity with fewer resources? A: Part of the transformation of Compuware in recent months was to align the organization very specifically around customer value goals that create greater efficiency. We recently formed six business units that allow us to be much more responsive to quickly changing business needs. It’s all about promptly providing solutions to our clients, especially as technology changes so rapidly. Q: How has Compuware been able to leverage cloud-computing to boost the bottom line? A: We use the cloud for lowering our cost of [computing time] and boosting our flexibility. It also represents a massive market opportunity for us. Cloud-computing has made us a fast-growing IT organization again. We allow companies to have visibility into their application performance all the way through the cloud to their internal data centers. One big problem when people move out to the cloud is that they loose visibility. We’re the only company in the world that provides one dashboard across the entire Web and cloud environment. Q: What are the strongest growth markets for Compuware over the next five years? A: The industry sectors that are leveraging cloud-computing the most, along with Web applications, are retail, financial services, manufacturing, and health care. That’s where I see growth coming, and we’re very active in all of those sectors. Q: Will Compuware play a role in getting to the singularity – the point at which artificial intelligence surpasses human brainpower? A: Our goal is to provide instantaneous answers through predictive analytics as to where IT problems are occurring and what needs to be done to solve them. This is a big field because of the Web and cloud-computing, and another trend called virtualization. IT has become more complex, and if we can deliver answers to problems before they occur, it will obviously be in the best interest of our clients. Why she is a Champion of the New Economy: Lisa Glush, president and CEO of Macprofessionals Inc., a technology integration company in Novi that works primarily with Apple products, says her biggest challenge is staying ahead of a rapidly changing industry. So far, so good: Revenue has climbed 40 percent annually, on average, since the company’s founding in 2000. Q: When you started, Apple wasn’t the powerhouse it is today. What was demand like in those early years? A: Initially, I started the company because there was a real niche for Apple professional services. At the time, the product was print-focused. We were 100-percent a services company. We didn’t want to sell products. But six months after we started, Apple came out with video, so we became more focused on video and broadcast. My background was in graphic design, and I had worked for a few years with another Apple reseller, but then I saw an opportunity to go out on my own. Q: How do you stay ahead of all the new product introductions today, including MacBooks, iMacs, iPhones, iPads, iPods, and the hundreds of applications? A: We actually do some app development around the iPad and iPod. Times really have changed. Apple [has become] much more centered on the enterprise market as it’s evolved from desktops and laptops into iPads, iPods, and iPhones. In fact, we now have a staff of four programmers and developers who focus solely on applications for Fortune 500 companies and other clients. We created an app for hospitality integration and created specialized apps for workflow integration at large companies. They’re all customized products. Q: Does Apple pull you in before they introduce products like the iPad 2? keynotes, like anyone else. It’s a challenge trying to stay on the cutting edge when things are changing so fast. We are constantly thinking of new ways to integrate all of the products for our clients. We read the latest literature and blogs, get together in committee groups, and do a lot of training. We have been fortunate to place orders ahead of a product launch on behalf of our larger clients. But for the most part, we wait for new products like anyone else. Q: The company recently opened an office in Canada. Are you looking to grow into other foreign markets? A: We’re seeing a lot of growth nationally, and Apple came to us to open an office in Windsor to support the education market. We’ve also done some engagements in the Bahamas. But most of our attention today is in the United States. We’re growing rapidly in California and Texas; we have technicians in Texas, Colorado, Florida, and New York; we have salespeople in Michigan, Wisconsin, and Illinois. We’re also growing our office here. We’ll soon move from 17,000 square feet [of space] to 40,000 square feet. We’re going to invest in Michigan, with the support of the Michigan Economic Development Corp. We were awarded an MEGA grant, so we’ll be investing a little over $2 million here. And we’ll try to hire everyone from here. Q: What’s the biggest challenge you face in expanding the business? A: We try to be very conservative. Beyond technology introductions, the big challenge is hiring the right people. Fortunately, Apple is considered a cool product, so we get a lot of interest from college students. We do hire a number of them. We mentor and train them, and we try as best we can to promote from within. It takes a long time to get up to speed on Apple’s platform. It’s not like you can take a class on it. Q: If Apple CEO Steve Jobs called and asked for advice on improving Apple’s bottom line, what would you tell him? A: Keep up with what you’re doing. They have a lot of cash for a large manufacturer. Steve is one of the best when it comes to thinking outside the box, pushing the envelope, and staying on the cutting edge. Q: What’s the next revolution in IT, or are we at the pinnacle? A: Mobile devices are hot. More and more, we’ll all be walking around with iPads and other tablets, along with mobile devices. There will still be a need for desktops and laptops, especially for executives. But students and younger workers are turning more and more to mobile devices and tablets because they’re more flexible and affordable. 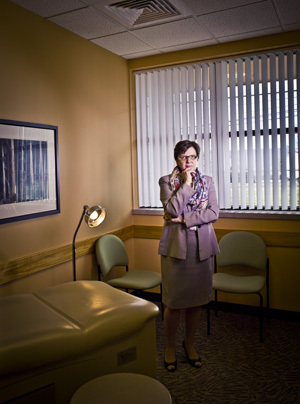 Why she is a Champion of the New Economy: Ewa Matuszewski and her team at Medical Network One, a physician’s organization, began offering a range of services that promote healthy lifestyles. The company works closely with private practice physician members and other health care organizations to develop a team approach to improve patient outcomes, called patient-centered medical homes. That’s “miles apart” from the company’s founding in 1981, when it mainly served as a third-party administrator. Q: What’s driving the changes to Medical Network One’s operations? A: In 2000, the health care community began to see costs increase dramatically. We started looking at changes we could make in the community at large. If we could retool our operations to boost value and quality of care, we felt it was a goal worth pursuing. As we began to examine the outcomes at that time, we discovered there was a dramatic increase in chronic illnesses such as diabetes and obesity, and it wasn’t just adults; it was adolescents, as well. In response, Medical Network One created the Michigan Institute for Health Enhancement. The first project was an adult weight management program that proved to be very successful. We also started to form educational programs that delivered best practices for individual health care to physician practice teams, community organizations and, ultimately, the workplace. Q: What changes are under way within hospitals and medical centers to boost patient care? A: Over the last few years, the foundation was laid at the national level for the resurgence of patient-centered medical homes, where a team of allied health specialists, working with the primary care physician, assess, monitor, and provide care and self-management education for a patient. We also advocated for our physician members to implement e-prescribing patient registries and electronic medical records, which offer the opportunity for e-consultations and e-visits. We began to educate physicians and their practice teams on the benefits of moving from a hierarchical operation to a team approach. There was more investment dedicated to R&D on how a practice team works. In 2006, we launched the community care travel team, where a health care team (registered nurse, certified diabetes educator, registered dietitian, lifestyle coach, behavioral health specialist, health educator, and exercise specialist) works with patients to evaluate, counsel, and help avoid or reduce the risk of complications from chronic conditions such as diabetes. The community care travel team provides services in primary care practices, worksites, and community and educational centers. Q: How do you mange the rollout of the Patient Protection and Affordable Care Act (Obamacare) when it’s being challenged in two different federal courts, and may get a review by the U.S. Supreme Court? A: It’s not going to go away. There are some really good components of the legislation. One is the patient-centered medical home, which boosts healthy outcomes, improves interventions, and provides patients with the highest quality medical care possible. The other component is the meaningful use of electronic medical records. Q: As large hospital groups transform into wellness centers, how will that impact your company’s operations? A: The health care community as a whole will succeed in providing high-quality health care when, for starters, more people know who their primary care physician is, and when patients regularly consult with their physician and their medical team. Right now, if we ask 100 people in a room to stand up, and then to remain standing if they can name their primary care physician, 60 people will sit down. The entire health care community has a lot of work to do to reverse that trend. It will benefit everyone. Q: How do you best tap technological advances that boost patient care and improve efficiency? A: Our job is to effectively train and educate staff members so that primary practice teams truly understand what they were doing in the past, and what results would emerge if they changed their practice. For example, we’ve implemented a modular approach to electronic medical records. We focus on improving one aspect of the technology, mastering that, and then moving on to the next one.